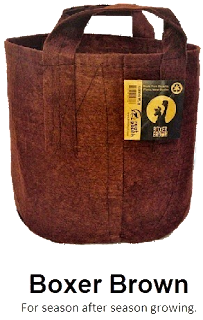 Growing your favourite plants in fabric Root Pouches is not only a great way to nurture their roots but is also a fantastic way to help keep plastic bottles out of landfill ..
Root Pouches are also great for use in Aquaponics and Hydroponics. 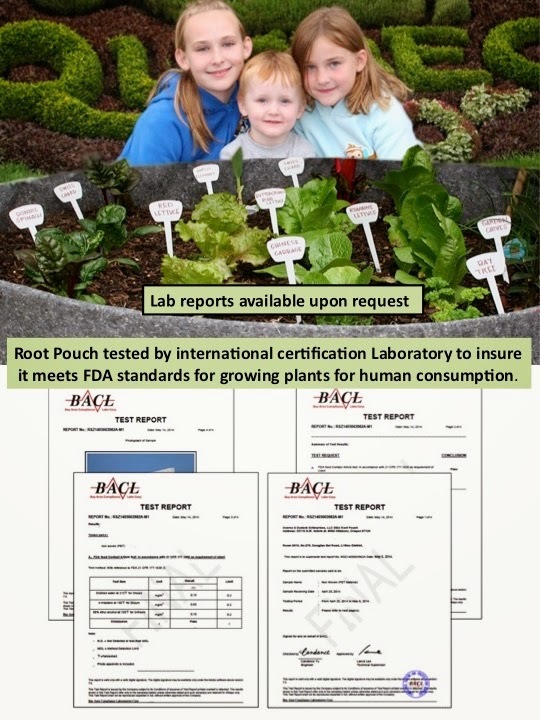 What are Root Pouches made of? Root Pouches are a fabric planting container/pouch that is made from recycled plastic water bottles and natural fibres..
"Root Pouch’s award-winning technology takes discarded plastic bottles that would otherwise clog our landfills and oceans, and turns them into plant pots, vertical garden pouches and erosion control sacks. Resilient and lightweight, our two types of fabric are designed to either be non degradable or to break down over time to let plants grow big and strong. The lifespan of our fabric is up to you, depending on the fabric you choose." Growing Healthy Roots using Root Pouches..
"The roots of the plant are either prevented from circling by either girdling (Not being able to spread the fibers apart) or by the tips of the roots penetrating into the air and causing the plant to air prune itself. Both of these effects are good, they both cause the roots not to circle but rather prune themselves." For growing strawberries, fresh culinary herbs, including basil, parsley, cilantro, mint, thyme, rosemary and sage, or for growing delectable lettuces choose from any of the 3.8-12L pouches. 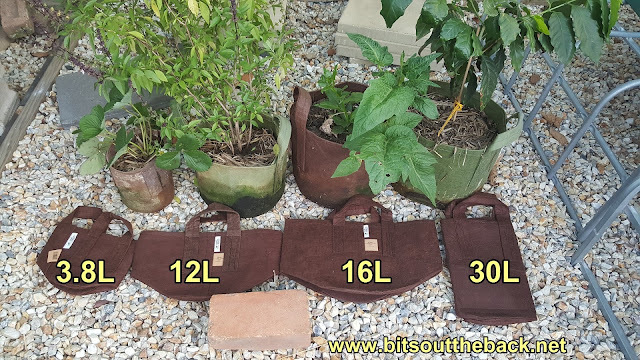 For best results grow only 1 or two plants in the 3.8L size pouch. 4 or 5 plants will grow comfortably in the 12L pouch if properly trimmed and maintained. Root crops such like carrots, radishes, beetroot, turnips and onions (green onions and full size) can be grown in 12 or 16L pouches. 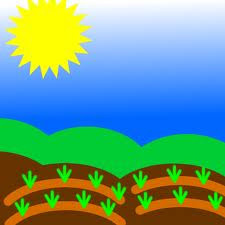 Sow/plant onions in rows or in a circular pattern. Thin plants for proper spacing to allow for desired root size and growth. For growing plants in the Brassica family such as broccoli, Brussels sprouts, cabbage, cauliflower, collards, kale and kohlrabi use the 16, 30 or 39L pouches; choice of size is determined by the eventual size of the plant. Delicious fruiting vegetables like tomatoes, peppers, eggplants can be grown to perfection in 16, 30 or 39L pouches; choice of size is determined by the eventual size of the plant. Traditional tomato cages fit comfortably inside of the 5 gallon pouches so plants grown in the larger sizes may require addition supports. Traditional farm house favourites like corn, bush style green beans, zucchini and squash can be grown in pouches ranging from 3.8 to 39L pouches. Single corn and green bean plants can be grown in the smaller sizes but zucchini and squash do best in 16L pouches or bigger. In a 16L container it is possible to grow 2-3 corn or green bean plants, with amounts increasing with pouch size. For climbing plants like cucumbers and small to mid-size pumpkins or watermelons 16 and 30L pouches are good choices. Give the plants a trellis or a similar surface to climb to keep them off of the ground and to add visual appeal to your garden. Start by planting about half way up from the bottom of the pouch. As the plant grows continue to fill up the pouch will a loose soil-mix, fluffy compost or even straw to allow the spuds to develop in a non-compacted environment. This approach can also be used when growing leeks. Perennial plants including blueberries, raspberries and even hops can be grown in pouches size 16 to 39L. When growing berries it is a good idea to choose a dwarf type variety that is bred and intended for container culture. For perennials in temperate environments that have a dormancy period through winter it is recommended to bring them inside or into a greenhouse so the winter freeze does not kill them. *It is important to remember that, for best results, when growing fruits or vegetables in containers there is an inherent need to use fertiliser. Both synthetic and organic forms of fertilisation can be used, so the choice is in the grower’s hands. For plant nutrient guidance consult your local garden centre or greenhouse employee, they can help. *Looking for a simple way to have a raised bed growing experience without all of the construction? Try the large sized pouches, ranging from 757 to 2271L, and plant a garden filled with an array of your favourites. 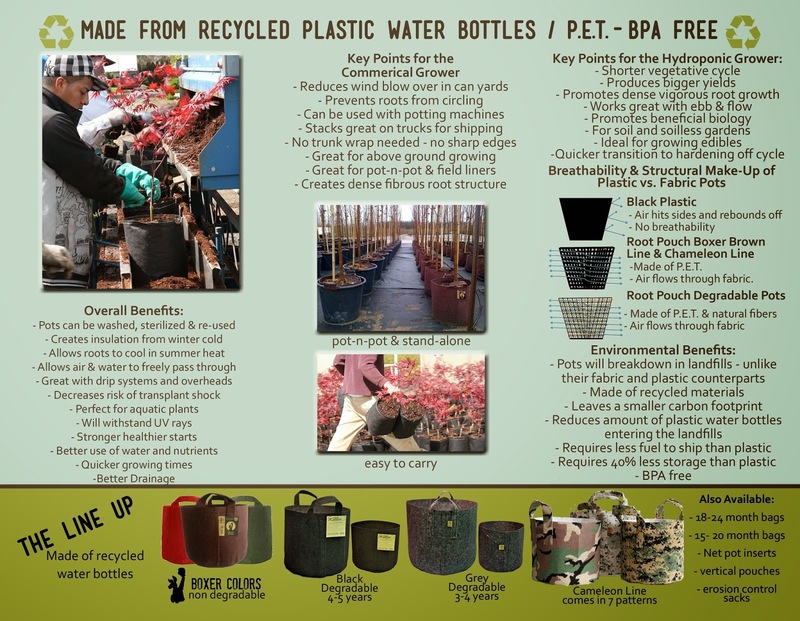 A guide issued by Root Pouch & Altered by Rob from RB’s Backyard Farming & Aquaponics for Aussie Customers. Other helpful Backyard Farming items can be found on our "Bits Out the Back" store. I am not selling goods directly through Amazon but do receive a small amount if you purchase when using the links provided. **Please note, I am a participant in the Amazon Services LLC Associates Program, an affiliate advertising program designed to provide a means for us to earn fees by linking to Amazon.com and affiliated sites. PLEASE NOTE, No GST is charged on orders at this time. All prices on this page are listed in $AU. a Paypal invoice can be generated and sent out to your nominated Email account. You don't need a PayPal account to pay via Credit Cards. All goods will be sent via Australia post unless otherwise arranged. Pre Paid Australia Post satchels are used to keep cost down where possible. Root Pouch orders need to be calculated on an order by order basis due to their bulky size. This is done to keep the postage rates as low as possible for all customers. Great prices, enviro friendly, recycled and perfect for growing food as well. Cheers Kathi. Have got some great looking cucumbers & carrots on the go in the backstairs pouch garden here at the moment. Such a pleasure to do business with; great product, great prices and great people. Thanks Dolly. Hope the plants are going gang busters for you. great to see you're green enthusiam and pragmatism. Was watching Geoff L on Urban Perm and spotted ur topic. Where are the Vert Gard's ? Love the value in ur PET "satchels" will make a purchase soon. I have found similar commercial bags helpful in placing plants temporarily in the ground (Testing micro-climate and/or visual aspects Or plants with vigorous roots. The root tip air pruning is a gas. Just found your comment sorry mate. I've only just got my first lot of verticals in for a customer. As soon as I know how many they need I'll be listing the remainder. Will add a few pictures today. Cheers mate & have a great one. I just love your Youtube channel, I really enjoy watching your life in an climate that is so far from our's here in the other side of the world. 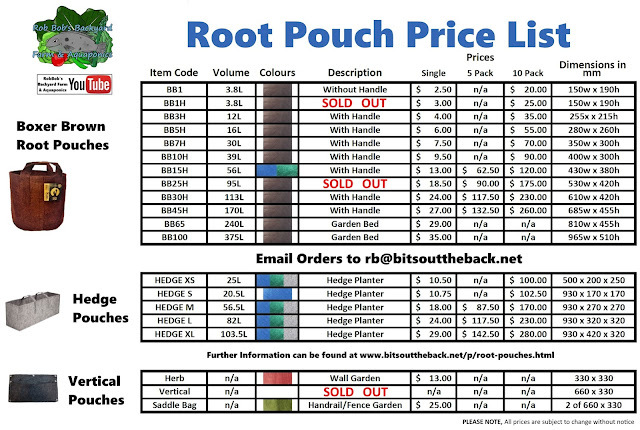 So to my question; I really want to buy your Root Pouch bags,,, but, do you send to the other side of our world?? or du you just sell locally? Would like to know how you get on Lars. Hi Rob, just started following your YouTube channel a few months ago and didn't know you had a website until today! Do you happen to sell any of the seeds you collect ? I don't sell the seeds sorry. Where there any i particular you were chasing? Glad the clips & posts have helped you out some Adam. Hope they grow you some top veggies mate. Had these suggested to me as we want to do a food forest on the front lawn and was going to plant the dwarf trees in the verg in very large pots in the ground so can be removed if needed, will these be fine in dug into the soil and used in place of the pots? Looking at the 95 or 130lt bags. I don't think these would be the best way to go as the roots will grow through the fabric if there is soil on the other side. It would be just as hard as digging them out roots & all. Might be best to go with the pots in that situation. Thanks Helen. Hope it helps some. Rob, I want to grow potatoes in a root pouch. U mention 126-246 litre being the preferred size. But I don't see this sizes in your list, or prices! I wanted 2-3 pouches, and can u tell me the cost and the postage, or we might travel from Redlands and pick the up?? Hi Francke. 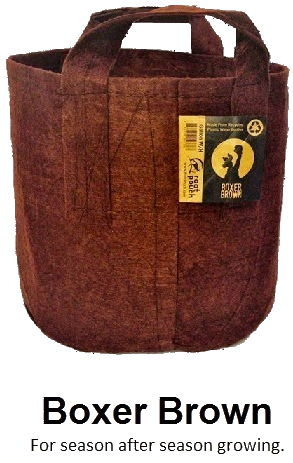 Root pouch folks suggest the 126-246 garden beds if you want to grow multiple plants in one bed. I think they can be grown in any size over the 30L as long as you don't overcrowd them too much.